The December 13, 2015 issue of the Chronicle of Higher Education features a reexamination of the concept of the “Male Gaze,” 40 years after the term was first introduced by avant-garde filmmaker Laura Mulvey . In this special report, the Chronicle invites four scholars to comment on Mulvey’s relevance today. Nowadays “intersectionality” is all the rage, and we sometimes forget that without the first cuts into the undifferentiated Subject, there would be no “sections” to re-theorize. Mulvey and other gender-centered theorists offered the first critiques of the abstract (but covertly male) “human” that philosophers such as Sartre had assumed in analyzing the meaning of the Look of the Other. As such, they opened the door to further challenges — for example, coming from race studies and disability studies, which have produced powerful accounts of what it feels like to move through the social world marked by one’s skin color or one’s wheelchair, and from lesbian film studies (and female directors) who have offered a whole new vocabulary of variations, visual as well as intellectual, on the female gaze. Bordo’s erroneous assertion that Mulvey “opened the door” for challenges to the lens through which white supremacy views non-white individuals and communities (when many such challenges predate Mulvey) isn’t even the most disturbing of her assertions. It’s very interesting to me that, even in 2015, Bordo writes dismissively of the idea of “intersectionality,” which she refers to as “all the rage.” Indeed, it’s the tone of her comment that points to the reason feminists of color, beginning around the same time Mulvey first published her essay, began to call for an acknowledgement of the ways race (and often class) impact women’s experiences of sexism. Apparently, even 40 years later, Bordo sees intersectionality as trendy, an assessment that overlooks the fact that for many of us, the idea of inhabiting marginalized racial and gender identities simultaneously is a simple reality of life, just as it was for our mothers and fathers, for generations prior, and for generations to come. That, to me, is anything but trendy. 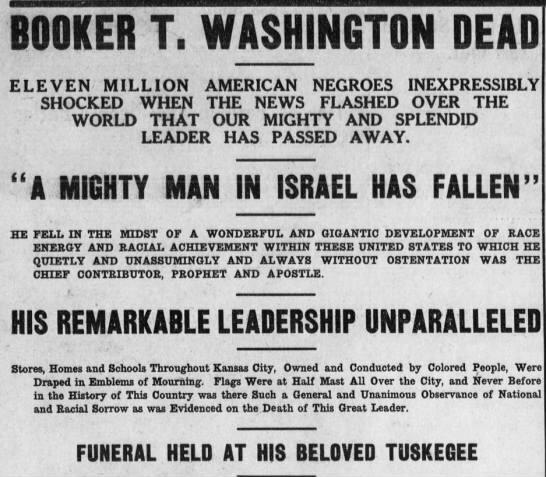 Announcement of the death of Booker T. Washington, from the front page of the November 20, 1915 issue of the Kansas City Sun newspaper. 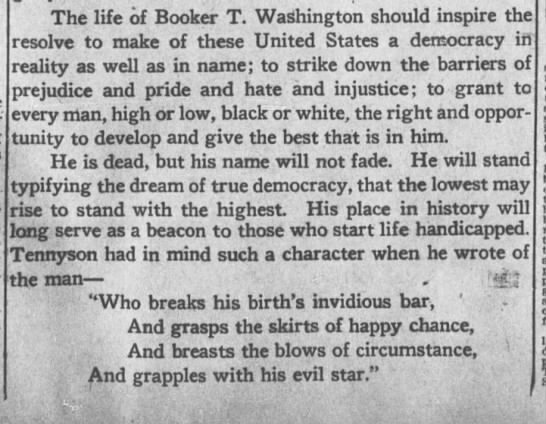 Today marks the 100th anniversary of the death of noted African American educator Booker T. Washington. The founder of Tuskegee Institute (now Tuskegee University), he was born into slavery in 1856 and spent his child on a Virginia plantation. 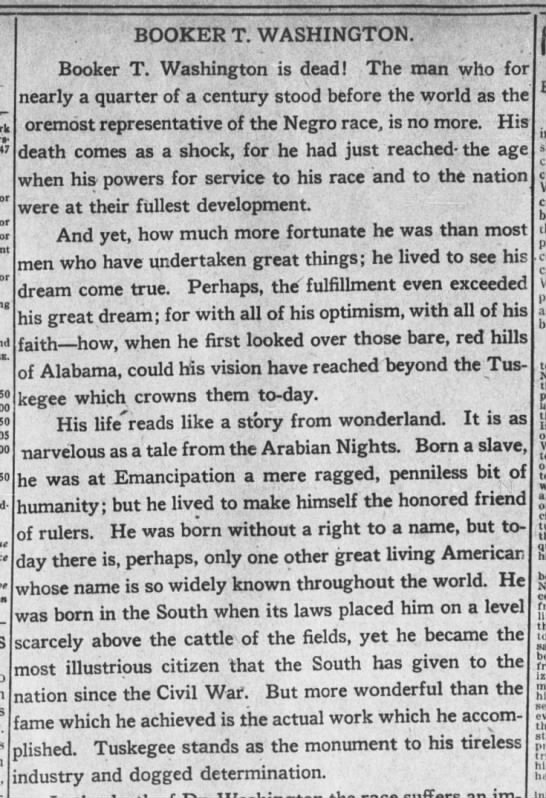 Dubbed the “Wizard of Tuskegee,” in recognition of his bold success in establishing an African American college in a small town of the deep South, Washington was easily the best known and most highly respected Black person of his time. Portrait of African American educator Booker T. Washington, founder of Tuskegee institute. 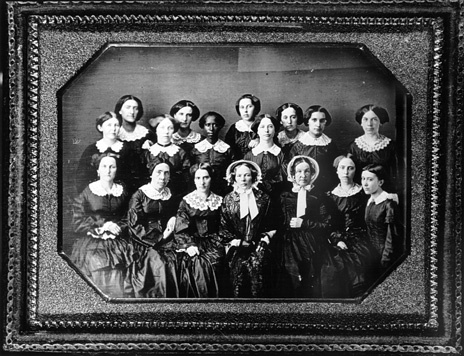 For a detailed biography of Washington, follow this link to Blackpast.org: Washington, Booker T.
Historic image of the Stewardesses of Charleston’s Emanuel A.M.E. Church, from The Afrikan Voice. Charleston, I am beyond words. My ancestry runs deep both in South Carolina and in the African Methodist Episcopal (A.M.E.) church, and I hurt for the Black people of your city, your state, and our nation. While no words or ideas can undo the violence that was done to the members of Mother Emanuel A.M.E. Church, the following thoughts, shared by some of the nation’s most brilliant Black thinkers and writers, might provide some affirmation of our sense of injustice, our rage, and our grief. 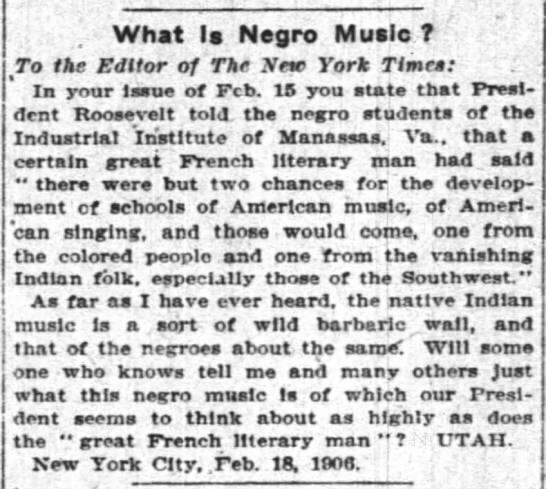 Survival for black folk during slavery, Jim Crow and well beyond necessitated thousands of small demonstrations of pleasant compliance toward white people. This didn’t just mean crossing the street when a white person approached; it meant keeping your eyes down while you did it. It didn’t just mean stepping off the curb for a white person; it meant smiling as you did it. Today, it means that when I discuss these shootings with my white students and my heart is bursting at the seams with outrage and grief, I must keep my voice and gestures gentle and calm and validate my students’ most hurtful comments so they don’t feel personally indicted. During a week when what it means to black was debated, the beautiful souls of Emanuel AME showed us with a powerful clarity. Beyond the legal construction of blackness by courts and census, beyond the dangerous and inaccurate biological construction of blackness by racist scientists and ignorant scholars, beyond the social construction of blackness by media and popular culture, Emanuel showed us what history has proven. Blackness is not only about being of African descent/ascent. To be black is to stand strong in the face of terror. To resist the temptation to give in to fear. To march on, no matter how hard the struggle. To hold onto one’s faith, even when hate is sitting right next to you. I ask that while we mourn this tragedy and other tragedies, we challenge ourselves and those around us to think on what we can do to change the status quo. What will we do to change a system that was not designed by us or for us? We live in a country where Americans assimilate corpses in their daily comings and goings. Dead blacks are a part of normal life here. Dying in ship hulls, tossed into the Atlantic, hanging from trees, beaten, shot in churches, gunned down by the police or warehoused in prisons: Historically, there is no quotidian without the enslaved, chained or dead black body to gaze upon or to hear about or to position a self against. I was not surprised by Roof’s age. Outspokenness of white supremacists may be on the decline, but white supremacist ideology exists in a range of ages. University of Alabama Homecoming Queen nominee Halle Lindsay, the first African American candidate for that post, was defeated after an election riddled with scandal. At colleges and universities across the U.S., midterms are approaching, football is in full swing, and students are settling into the rhythm of the school year. Who were last week’s movers and shakers, what initiatives, achievements, and changes did early October bring? At the University of Alabama, it’s first African American candidate for homecoming queen was the object of active campaigning against her, spearheaded by members of her own sorority. 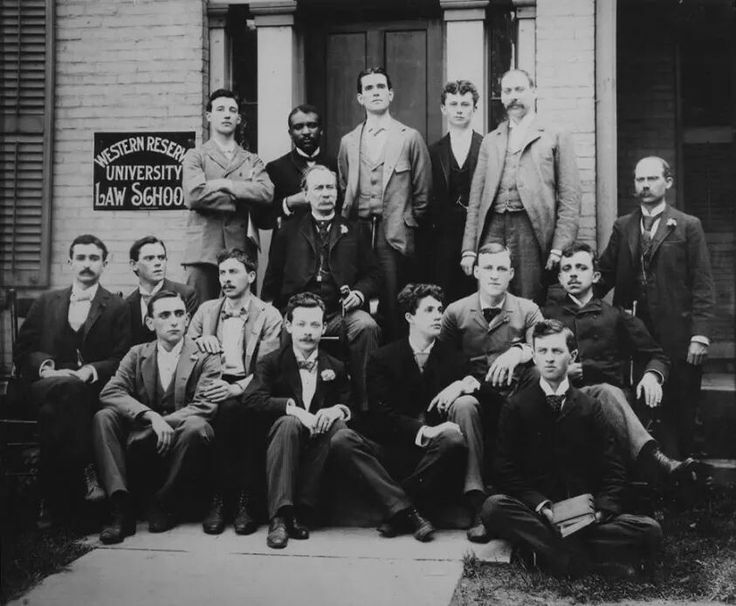 The University of Maryland announced it will rename its Art-Sociology building for Parren Mitchell, the first African American student to take graduate classes at the institution. The newly-named building will join the Mitchell Building, already named for Parren’s brother, Clarence. This means both brothers will have buildings named for them, on the Maryland campus. With a victory over Oklahoma, the Texas Longhorns gave a much-needed victory and a whole lot of hope to Longhorns head coach Charlie Strong, the first African American to serve in that post. The University of Arkansas named Associate Professor of Political Science Pearl Dowe the Interim Director of African and African American Studies. 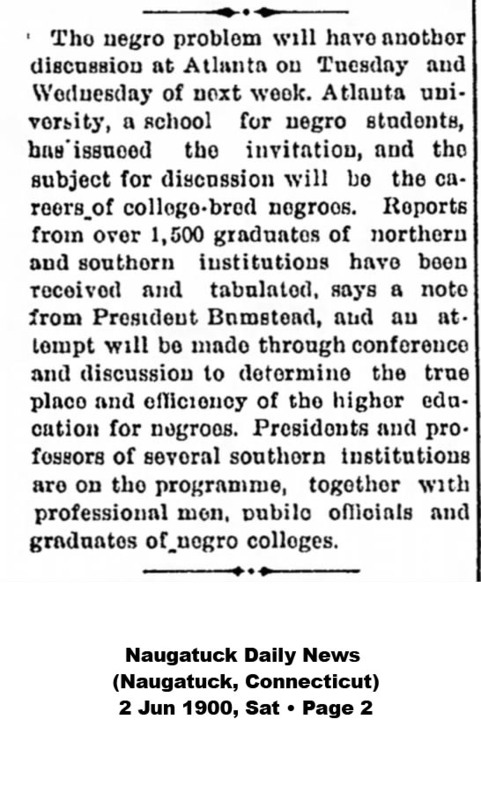 The University of California-Berkeley was criticized by some for its $20 million push to attract Black students and faculty.